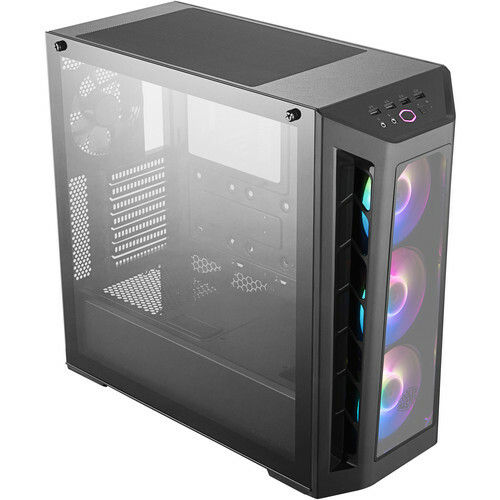 The MasterBox MB530P Mid-Tower Case from Cooler Master is a stylish case with three tempered glass panels and customizable RGB lighting support. Moreover, it has a dedicated RGB lighting button on its front I/O and comes with a 2-to-3 ARGB splitter for connecting compatible devices. Inside, it can fit up to an ATX motherboard, two 3.5" drives, four 2.5" drives, and seven single-slot PCIe cards. For cooling, it comes with four pre-installed 120mm fans: three RGB ones at the front and a regular non-RGB fan at the back. It also supports up to a 360mm radiator at the front should you opt for liquid cooling. Box Dimensions (LxWxH) 22.0 x 21.25 x 11.25"
MasterBox MB530P Mid-Tower Case is rated 4.0 out of 5 by 1. Rated 4 out of 5 by Nicholas from Great Case - Excessive ARGB Wires This is my first build with ARGB case, and wow alot of wires. The case is great. I would replace the back fan to give better flow, but good room, plenty of areas to hide a normal amount of wires, but wow again. I would buy again.